The Portuguese were the first Europeans to arrive in Japan in the 1540s, but it was undoubtedly the Dutch who were by far the canniest traders in the Orient. In the lull between the fall of the Ming Dynasty and the rise of the Qing Dynasty in what is referred to as the Transitional Period (during the 1640s) in China, very little porcelain was made. 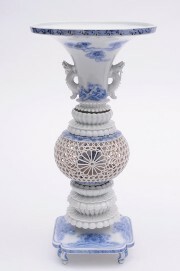 Initially, the Dutch relied on porcelain they had stockpiled in Formosa (now Taiwan), but as that ran down, they looked further east towards Japan. Shortly before this period, owing to the over exuberant activities of Jesuit missionaries and the collusion of the Dutch and the British, the Portuguese were expelled from Japan until 1854; leaving them and the Chinese a free rein to deal with the Japanese and trade on to Europe. The first large scale export didn't really start until 1659 when the Vereenigde Oost-Indische Compagnie (VOC) ordered 70,000 pieces – though the Arita kilns had not yet developed sufficiently and could only produce half this number. Whilst much of the order was for blue and white porcelain, there was some enamelled ware, though because of the sparse decoration it was a slow seller. 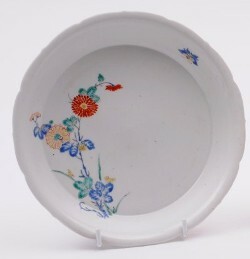 A Kakiemon dish, circa 1680. Presumably this was Kakiemon (usually using persimmon red, blue, green sparingly on a white ground). The following year saw a new and subsequently popular form of decoration, known as Imari. It was in underglaze blue, red and gold and was acceptably busier in design. Ironically, demand for Imari became so popular that Chinese kilns started to produce the same pattern, often referred to as Chinese Imari. Imari porcelain, late 19th century. 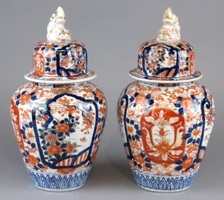 By the 1740s, the trade in Japanese porcelain largely died out, but was much copied by domestic European potters. One can surmise that this was as a result of the Chinese regaining technical expertise and subsequent volume of production. The catalyst for more vigorous ceramic production was initiated by a captured Korean potter called Ri Sampei who eventually found deposits of porcelain clay in Arita around 1615-20. Much Japanese porcelain, particularly export wares (with the exception of the above mentioned Kakiemon), was based on the smaller southern island of Kyushu near the town of Arita, whose main port is Imari. So from this, it is generally safe to assume that the accepted western nomenclature for Japanese ceramics is geographically based. A typical example of Hirado porcelain. Whilst something of an over simplification, Arita porcelain is a term used for blue and white porcelain produced in the area and Imari for that more colourfully decorated. Another proximal porcelain town is Hirado that produced a brilliant white, clear glazed ware painted in blue; approximately from the mid 18th till the mid 19th century, which also specialised in finely incised detail and intricate openwork. 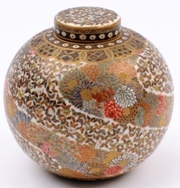 Perhaps, in volume terms, other Japanese ceramic groups worthy of mention are Satsuma, again initiated by relocated Korean potters and their families near Kagoshima on the island of Kyushu, but on this occasion the raw material was not porcelain clay but coarser brown or off white earthenware. Typically, it has a clear but crazed glaze with finely detailed coloured decoration and liberal use of gold. From the late 18th century, production moved to the Northern island of Honshu near to Kyoto. This later phase is referred to as Kyoto Satsuma. The final group was only ever produced on the northern island of Honshu and is known as Kutani – meaning Nine Hills. It was initially rather coarsely potted and initially was decorated in thick yellow, green and aubergine hues; latterly being more thinly potted and restricted to iron red, black and gold colour schemes.